Bouncy white bead earrings that have a Hobe style. All of the beads except for the central bead are attached separately to an internal platform that is connected to the brass filigree back. 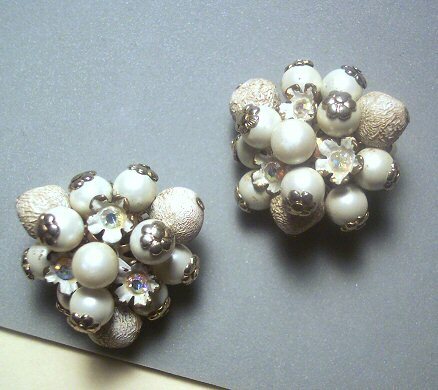 The bubbly beads are not damaged, but have a textured enamel finish. Metal bead caps and enameled florets add interest. Earrings measure1 1/4". Unsigned. Circa 1940s or 50s. I have cleaned these earrings lightly to remove surface dirt. Very good condition.